The English version "Architectural Geometry" was published in 2007 by Bentley Institute Press. 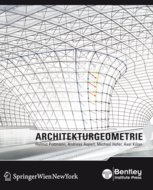 Motivated by the huge success the authors translated chapters 1-11 and 16 to create a shorter German version entitled "Architekturgeometrie", published jointly by Springer and Bentley Institute Press in 2010. 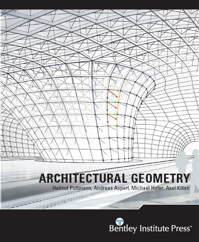 You may order the German version "Architekturgeometrie" online at the Springer website or at Amazon.de. You may order the English version "Architectural Geometry" online at the Bentley Institute Press website or at Amazon.com. Within Europe both books may be ordered online via the Austrian Bookstore www.lmz.at. Geometrie steckt im Kern des architektonischen Entwurfsprozesses. Sie ist omnipräsent, von den ersten Schritten der Formfindung bis zur eigentlichen Konstruktion. Moderne Konstruktionsgeometrie bietet eine Reihe von Werkzeugen für effizientes Entwerfen, Analyse und die Herstellung komplexer Formen. Das führt zu neuen Herausforderungen, sowohl in der Architektur als auch in der Geometrie. Architekturgeometrie ist daher als integrative Forschungsaufgabe zu sehen, die an der Grenze zwischen angewandter Geometrie und Architektur angesiedelt ist. Architekturgeometrie wurde als Lehrbuch für Studenten der Architektur und des Industriedesigns geschrieben. In einer einfachen, auf eine Fülle von Abbildungen gestützten Darstellung werden Grundkenntnisse über geometrische Objekte, bis hin zu freien Formen, über deren Modellierung und digitale Bearbeitung vermittelt. Ebenso werden Querverbindungen zu wichtigen Fragen der aktuellen Forschung hergestellt. Die vorgestellten Konzepte werden mit der Mathematik so weit vernetzt, als es für den Einsatz von Skript-Methoden in parametrischer Modellierungs-Software notwendig erscheint. Das Buch ist auch als Nachschlagewerk für Architekten gedacht, für Bauingenieure und Industriedesigner als Quelle der Inspiration und für Wissenschafter die an Geometrieanwendungen für Architektur und Kunst interessiert sind. H. Pottmann, A. Asperl, M. Hofer and A. Kilian: Architectural Geometry. Bentley Institute Press (2007), 724 pages, 2200 figures in color, ISBN 978-1-934493-04-5. This book has been written as a textbook for students of architecture or industrial design. It comprises material at all levels, from the basics of geometric modeling to the cutting edge of research. During the architectural journey through geometry, topics typically reserved for a mathematically well-trained audience are addressed in an easily understandable way. These include central concepts on freeform curves and surfaces, differential geometry, kinematic geometry, mesh processing, digital reconstruction, and optimization of shapes. This book is also intended as a geometry consultant for architects, construction engineers, and industrial designers and as a source of inspiration for scientists interested in applications of geometry processing in architecture and art. Mark Pauly, Applied Geometry Group, ETH Zürich The Eurographics Association and Blackwell Publishing Ltd., 2008: "[...] This book is a visual gem. Not less than 2200 illustrations and photographs provide visual explanations of geometric concepts, illustrate the application of the discussed topics in classical or contemporary architecture, and stimulate the reader's imagination. A truly delightful read, 'Architectural Geometry' is predestined to become the bible of the recently emerging field of architectural geometry." Dörte Welti, Swiss Magazine: "We're not all architects. But what [...] have compiled is a 700-page work that will hold industrial designers, graphic artists and fashion designers in equal thrill all over the world. This fascinating study of the intrinsic geometries of some of the biggest buildings of our times is a must for the specialist and a delight for the casual reader." "Natürlich ist nicht jeder von uns Architekt. Aber was [...] da auf 700 Seiten zusammengetragen haben, wird auch Designer aus Industrie, ja sogar Mode staunen lassen und Grafiker aus aller Welt finanzieren. Die minutiöse Aufarbeitung geometrischer Zusammenhänge einiger der gigantischsten Bauwerke unserer Zeit - für Fachleute ein Muss, für Laien ein spannendes Coffee-Table Book!" Miles Ritter, Princeton University School of Architecture: "'Architectural Geometry' is a superior, comprehensive survey of geometric modeling for architecture filled with stunning illustrations of unparalleled precision and clarity. The authors are at the forefront of research into advanced modeling technologies and the underlying geometrical principles upon which they are based, and it thus contains, particularly in the later chapters, advanced topics such as shape optimization, PQ meshes, and surface development that are at the cutting edge of the discipline. For those involved in the construction and refinement of geometrical pipelines for architectural modeling and production, I expect it will become the standard reference. 'Architectural Geometry' is not just the best text of its kind, it is unique." Gary Hack, University of Pennsylvania School of Design: "The new book 'Architectural Geometry' is perfect for students and teachers of architecture, practicing architects, and other professionals seeking an in-depth understanding of geometric principles and their integral relationship to the world of design. Its content is fundamental and will be not only relevant but essential for many years to come. I've asked that copies be added to the PennDesign library and firmly believe this singular work belongs in the library of every high school, college, and university offering architecture and engineering design as part of its curriculum, as well as in the offices of architectural and design organizations around the globe." Andre Brown, Liverpool University: "This book is a carefully considered, well-structured, balanced, and informative book on constructive geometry and its application to design for the built environment in a contemporary setting. It mixes theoretical ideas, how-to advice, and real-world examples, and will appeal to a wide range of potential users, from students to educators and practitioners." Manfred Husty, Innsbruck University: A review in German published in the IBDG 2/2007, Jahrgang 25, University of Innsbruck [Pdf]. A list of errata for the first edition (2007) of the book.